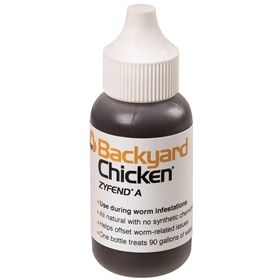 Zyfend A from Backyard Chicken prevents and treats infestations of intestinal worms and other parasites! 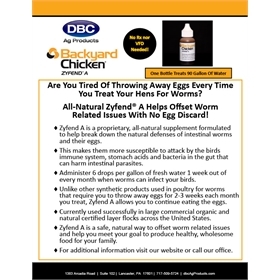 Unlike other dewormer products which require you to toss eggs in the trash for 2-3 weeks during treatment, you won't have to "withhold" your eggs with Zyfend A -- you can enjoy them as normal! 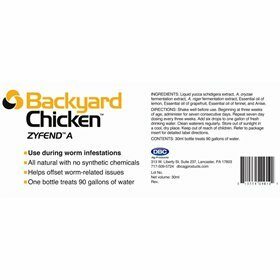 Zyfend A is unique in that it doesn't kill parasites; rather, it helps to break down their defenses so that the chicken's own, natural defenses can effectively kill the parasites. 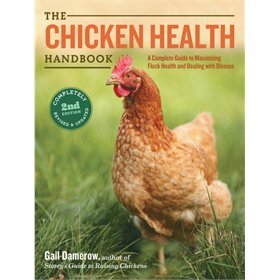 Once compromised by Zyfend A, the chicken's immune system, stomach acids, and "good" gut bacteria will all work in concert to clear out intestinal parasites. Directions: Shake well before use. Beginning at three weeks of age, administer for seven consecutive days. Repeat seven day dosing every three weeks. 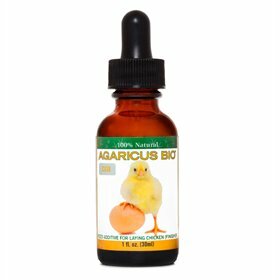 Add six drops to one gallon of fresh drinking water. Clean waterers regularly. Store out of sunlight in a cool, dry place. Keep out of reach of children. 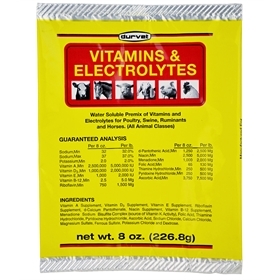 Refer to package insert for detailed label instructions.